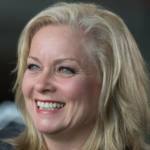 Linda Hasenfratz was named CEO of Linamar in 2002. She joined Linamar in 1990 and worked her way up from the shop floor. She held a variety of positions from Machine Operator all the way up to Division General Manager. Since Ms. Hasenfratz assumed corporate level responsibilities, Linamar sales have grown from CAD $800 million to more than $6.5 billion. Among many board appointments, she currently sits on the boards of CIBC, Faurecia and the Business Council of Canada. She is the recipient of many international and Canadian business awards. Linamar Corporation (TSX:LNR) is a diversified global manufacturing company of highly engineered products powering vehicles, motion, work and lives. The Company is made up of 2 operating segments – the Transportation segment and the Industrial segment – which are further divided into 5 operating groups: Machining & Assembly, Light Metal Casting, Forging, Skyjack and Agriculture. It has more than 29,000 employees in 60 manufacturing locations, 8 R&D centres, and 25 sales offices in 17 countries, and generated sales of CAD $6.5 billion in 2017. 1- Advanced manufacturing applies advanced technology – advanced robotics, digitally connected machines, data capturing equipment, AI, and others – to the manufacturing sector in order to drive efficiency with the aim of optimizing the processing and the cost of our manufactured goods. 2- Canadian manufacturers are investing heavily in the technology and innovation that will drive their competitiveness and business growth. Canada’s deep pool of AI talent focused on research and applications is a considerable competitive advantage in this respect. 3- Automation in manufacturing will reduce lower skilled, lesser paid jobs but increase high skilled, better paid jobs. The Canadian government must reduce Canada’s corporate tax rate to increase our companies’ global competitiveness, support the manufacturing sector by monetarily helping companies to invest in both incremental and disruptive innovation, and ensure that the manufacturing sector is working in a fair regulatory environment. How would you define “advanced manufacturing” and the technology that enables it? Advanced manufacturing applies advanced technology to the manufacturing sector in order to drive efficiency. It entails the use of machines that are connected to each other digitally and equipment that records and sends data. A big part of advanced manufacturing is the use of digital tools to streamline and analyze the data connected machines generate. This kind of data analysis improves predictive maintenance, betters tool-life management, reduces cycle times, and increases the uptime of equipment. Advanced manufacturing also incorporates advanced robotics, collaborative robots (cobots) and all-terrain vehicles on the shop floor to improve vision gauging. Ultimately, the aim of advanced manufacturing is to optimize processing and the cost of our manufactured goods. Up until a few years ago, we were restricted in our ability to automate all aspects of the manufacturing process because certain tasks required the human eye. Machines were not, until the advent of machine learning over the last few years, able to recognize and respond to what they were seeing. Vision systems were a bit archaic, could not handle different kinds of lighting and did not know how to recognize things. But now, we can teach them through machine learning and these systems can get better at taking over tasks like visual inspection. So, AI is enabling us to automate some tasks that are, frankly, the worst jobs on the shop floor. Visual inspection at the end of the line is a terrible job; you are staring at parts all day and are never 100% right. How competitive would you say Canada is in advanced manufacturing? I think we are enormously competitive. Canadian manufacturers, certainly in the auto sector, are investing enormously in technology and innovation to drive our competitiveness and business growth. Moreover, Canada’s growing expertise in AI research and applications is a huge advantage for our advanced manufacturing sector. We are sitting in the middle of a massive concentration of machine learning knowledge and talent. Why is NGen – Canada’s Manufacturing Supercluster – important and what opportunities will it pursue? Canada’s Manufacturing Supercluster is going to be highly collaborative. I love the idea of the superclusters because we are using our collective knowledge to try to make faster progress on some big-ticket issues. Solutions to issues like vision gauging, metallic additive manufacturing at scale and others will be extremely valuable to the manufacturing sector as a whole. The focus of the Manufacturing Supercluster is surely going to be on more applied issues, that is, on solutions that are closer to commercialization. We are not going to be doing fundamental research because there is already plenty of money going towards it from other sources. I have never seen as much opportunity, certainly in the spaces that Linamar is focused on, whether it is our transportation and automotive business, our harvesting business or our access business at Skyjack. We see tremendous potential for topline growth with new business opportunities. Improvements in efficiencies will help us manufacture better, faster, lower cost, better quality, more repeatable, and more competitive products. What can the major stakeholders of Canada’s manufacturing industry do to accelerate its development and increase its competitiveness? There are obvious tactical things that we should be doing. For example, Canada’s corporate tax rate is too high, which puts Canadian companies at a disadvantage. Tax rates are a fundamental cost that people will evaluate when deciding where to locate their business. I think lowering our corporate tax rate is a no brainer. Secondly, I definitely want to see continued focus on innovation and the government can help companies to invest in technology to drive that innovation. I have no doubt that I can win business at a global level for our Canadian facilities. Linamar has 23 plants in Canada and 60 plants globally. But I can assure you that our Canadian plants are the most productive. Moreover, a quick win for the government would be talking positively about the manufacturing sector. There are so many examples of great Canadian companies that invest in R&D and innovation, are highly productive, and produce really unique products. So, it is frustrating that you are more likely to hear that Canadian companies are not productive or not investing in R&D, instead of hearing about the success stories. The problem is that our government tends to take broad-based statistics and come to very specific conclusions about what is happening. However, the reason the government draws the conclusion that Canadian companies do not invest enough in R&D is that it uses the Scientific Research and Experimental Development (SR&ED) tax credit as a proxy for R&D investment. In fact, SR&ED is only one slice of R&D. I am not suggesting that SR&ED is not appropriately defined, but the definition is quite tight as to what qualifies for SR&ED claims. SR&ED only includes research on completely new science or products, and leaves out research on the improvement of existing products. On the other hand, most people would classify product development as R&D in their organizations. So, at least half of what we define as R&D is not SR&ED eligible. For example, Linamar just bought MacDon, which is a harvesting equipment business. They have over 100 engineers in their R&D department, over 100 patents, and spend somewhere around $50 million a year on R&D. But only 20% to 30% of that is SR&ED eligible. It is critical that we understand that the actual R&D spent is three to four times what SR&ED statistics show. So, I would suggest that the Canadian government also consider supporting the manufacturing sector by monetarily helping companies to invest in both incremental and disruptive innovation. Furthermore, the government must ensure that the manufacturing sector is working in a fair regulatory environment. We can be socially conscious and efficient at the same time. How will the use of advanced technologies in manufacturing affect employment? Interestingly, advanced manufacturing will impact direct and indirect workers differently. A “direct worker” is someone who is directly involved on the shop floor, whereas the term “indirect worker” refers to everybody else – administrative staff, financial auditors, and others like them are all indirect workers. I am an indirect worker. Although our direct workforce has been growing over the last six to seven years, our indirect workforce has been growing at double the rate. Our direct headcount has increased by 36% over the last seven or eight years, but our indirect headcount has increased by 62%. I have no doubt that our indirect workforce will soon be larger than our direct one. We are automating more direct jobs, which also tend to be more repetitive and less interesting. Indirect roles are more interesting and revolve around optimizing cycle times, optimizing tool laying, programing and maintaining equipment. These are skilled trade jobs that help to keep automated systems running, so their demand is growing across the manufacturing sector. Over the last 7 or 8 years, our total headcount has increased by 46% but our payroll has increased by 76%. So, the manufacturing industry is moving towards higher skilled and better paid jobs. *Note: This interview was conducted at the 2018 Machine Learning and Market for Intelligence Conference hosted by Creative Destruction Lab at the Rotman School of Management at the University of Toronto.